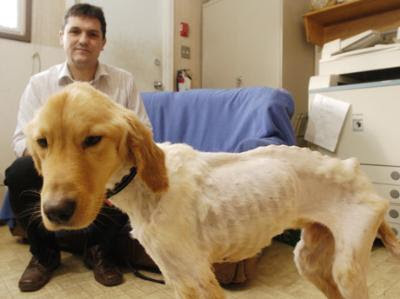 It's a terrible crime to do this to a beautiful, defenseless Golden (or any animal). I love golden retrievers and it totally broke my heart to hear of this story. These guys are so loyal which makes it even more sad. The Maple Ridge SPCA is having a fundraiser for him today. Click here for more details if you live in this area and want to show your support. It's raining right now but once the rain lets up, me & Eddie hope to take Mylo there for a bit. Hopefully they'll still be there and didn't cancel the event. Oh my!! This too brings tears to my eyes. I just don't understand how people can do this to an animal. I also am a golden lover, we have a 3 yr old female golden named Oakley. Please keep us posted about Trooper if you can. I'd love to hear of him getting healthy and finding a well loved family he deserves. Ouch! It's so sad to see the dog in that condition. Totally heartbreaking! I can feel the the pain...and the feeling of being hungry for days is not easy! The owner should be CRUCIFIED!!!! too disturbing for words....this makes me SO very sad. I'm glad he was rescued. Oh my gosh this poor baby. We actually were down to 5 dogs and my husband and I were happy. Well.... my children see to think 2 more needed to live with us. We are up to seven dogs now. Every time some one has a dog that needs a new home they seen to find our home. I hope Trooper will survive and be happy. I've worked in animal rescue my entire adult life, and even I gasped out loud when I saw this photo. It's terrible how lax our animal cruelty laws are. Far too often an animal has to get to this point before anything can legally be done. Thanks for posting this. It's an important reminder to not only support rescues and shelters, but also to contact our legislators and let them know that we need their help to pass stronger animal cruelty laws that allow animal control to step in before things get this out of control.